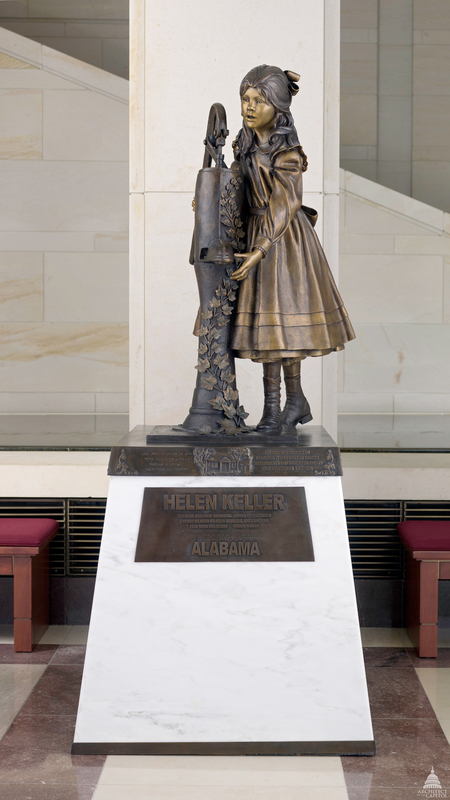 This statue of Helen Keller was given to the National Statuary Hall Collection by Alabama in 2009. Keller's statue replaced a statue of Jabez Lamar Monroe Curry, which Alabama had donated in 1908. Helen Adams Keller was born on June 27, 1880, in Tuscumbia, Alabama. When she was 19 months old, an illness (possibly scarlet fever or meningitis), left her deaf, blind and unable to speak. From her childhood teacher and life-long companion, Annie Sullivan, she learned to communicate by touch, Braille, and the use of a special typewriter; in 1890 a teacher from a Boston school for the deaf taught her to speak. She attended the Cambridge School for Young Ladies and then entered Radcliffe College, from which she graduated with honors in 1904. Settling outside Boston, Keller and Sullivan collaborated on Helen's autobiography, The Story of My Life. Soon, encouraged by Sullivan's husband, Keller embraced a variety of social causes, including woman suffrage. She lectured and wrote in support of these causes as well as to call attention to the plight of the physically handicapped. Following World War II, she and her secretary, Polly Thompson, traveled abroad to support the blind. She died on June 1, 1968, in Westport, Connecticut; her ashes are interred at the National Cathedral in Washington, D.C. The statue by Edward Hlavka depicts a moment made famous in the biographical play and movie The Miracle Worker. It shows Keller as a seven-year-old girl wearing a pinafore over her dress. She stands at an ivy-entwined water pump with her right hand on the pump handle and her left beneath the spout to feel the flow of the water. Her expression of astonishment shows the moment when she and Annie Sullivan first communicated, by touch, the word "water." On the front of the statue's self base, above the name "Helen Keller," is a relief image of Ivy Green, the Keller family estate, accompanied by explanatory text. On the proper left and right sides are, respectively, a statement about the significance of her college graduation and a quotation from Keller about Annie Sullivan’s importance to her life. The pedestal is clad with panels of Alabama White Marble. On the front is a bronze plaque bearing another quotation: "The best and most beautiful things in the world cannot be seen or even touched, they must be felt with the heart." The inscriptions appear in both raised letters and Braille characters. Edward Hlavka, a native of South Dakota, began to create and exhibit sculpture while in grade school. Later, inspired by the works of Renaissance masters during travel in Italy, he attended the College of Art and Design in Minneapolis and continued his studies in workshops, classes, and apprenticeships. His work has received awards in national exhibitions. Among his sculptures are portraits of Presidents Thomas Jefferson, Martin Van Buren, Franklin D. Roosevelt, Richard Nixon, and George Bush for the City of Presidents; and a monument representing the Oneida Indian Nation for the Smithsonian Institution's National Museum of the American Indian.